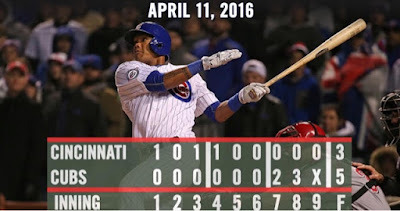 Wow: A little under a year ago, Addison Russell teed off for his first career home run. It came on May 1 and it landed with a thud against the still-under construction left field bleachers. This one could not be more different. After the Cubs put about a million home runs into the bleachers (and on top of scoreboards) in the NLDS against the Cardinals last October, it was only fitting that Addison Russell opened the 2016 season with another giant home run, and just as memorable. In a season where I've already gone on record with my prediction of the Cubs winning the World Series, I think even the most skeptical fan would admit that this is the best team in baseball right now, and that's after losing one of the top 10 young players in baseball for the season. Russell's home run is going to start off a million 2016 Cubs tribute videos. And when you can start off the season with an exclamation point like that? Don't Forget: Jason Heyward opened his Wrigley career as a Cub with a clutch hit to get the Cubs on the board in the 7th. Russell's bomb is the highlight, but Heyward got things started on a night where it didn't look like the Cubs were going to do much of anything. Thing I Noticed: Unlike Cubs teams of years past, even when the Cubs weren't doing anything for the first 6 innings, they didn't look terrible, if that makes sense. It didn't show in the box score, but the Cubs didn't seem to be getting fooled, and actually had Brandon Finnegan running up a decent pitch count, with a not-so-great balls to strikes ratio. It's not surprising that the Cubs got him out of the game when they did. With a team that has the ability to see so many pitches and really make starters work, it's only a matter of time until they get their runs. Teams like the Giants and Royals are like that, where even when they aren't doing well, they don't look terrible doing it. Also, the Giants and Royals have played in 4 of the last 6 World Series, winning 4. One Last Thing: I just want to sit here and rewind the last 3 innings on repeat so I'll cut this off. If you're reading this, you probably watched it happen so you don't need me to tell you how great the game was. I will leave you with this - I started writing this Gist (yes, even the 5-3 final in the title) after Kawasaki flied out to end the 8th. I had no doubt that the Cubs would close this one out. I don't remember any other time I would have done that as a Cubs fan. Off day today, and then back at it 6:05 Wednesday night against the Reds. Alfredo Sauceman vs John Lackey.